Long-awaited book about the domain name industry released today. What do you get when you take current reporting about the domain name industry, put it into the hands of an accomplished journalist, and give him a year to research and write about it? You get The Domain Game, the most thoroughly researched and interesting coverage of the domain name industry ever printed. 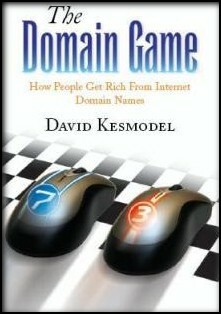 Author David Kesmodel was introduced to the domain name industry while writing a few articles for Wall Street Journal Online. He took time off to write The Domain Game, and has since returned to the WSJ print edition. The Domain Game starts with the story of Frank Schilling, the legendary domainer who took his family’s $200,000 life savings and invested it (and more) in domain names. It also features other feel good stories, such as that of watermelon farmer Scott Day, who now owns arguably the best portfolio of domain names in the world, including Recipes.com, Shops.com, and, of course, Watermelons.com. Or the single father who lived a life in debt until he discovered domain names. The book also does a fine job of explaining the history of domain names and in particular the expired domains drop. It details how people like Yun Ye mastered the expired domain drop to build a portfolio worth over $100 million. But of course there’s a dark side to the domain name industry, and that’s where Kesmodel’s long hours or research hit paydirt. The book discloses little known facts about some of the biggest people and companies in the industry. Some of it’s good; some of it’s bad. Whereas many in the domain industry have merely made accusations about various domain companies, Kesmodel researched court filings and connected the dots. He gets into the details of iREIT’s trademark fiasco. He writes about how domain registrar Dotster tasted domains and told its employees to not disclose its ownership to anyone who inquired. Including Neiman Marcus, one of its customers that ultimately turned around and sued it for owning trademark typos of its brands. He connects the dots between Oversee.net and NameKing and Chesterton Holdings, another trademark infringer. I’ve recommended a handful of books to domainers, but this is one I don’t need to recommend. This is a book that every domainer will be talking about in the coming weeks. The book can be ordered online at Xlibris.com for $19.99 in paperback and $29.99 in hardcover.